Salicylic Acid is a compound of natural origin, found in willow bark. Its main action on the skin is to produce exfoliation. Exfoliation is crucial to open up the bumps and ingrown hairs and to prevent their formation in the first place. Acetyl Salicylic Acid is the ester derivative of Salicylic Acid, and it has skin soothing and exfoliating properties. It is very sensitive to moisture and unstable in water. In the presence of water, Acetyl Salicyc Acid converts to Salicylic Acid. Our competitor’s formulation have water and therefore even though they declare Acetyl Salicylic Acid as one of the ingredients, it would be unstable in the presence of water. So all they are selling is concentrated Salicylic Acid. That is why their products have short expiration dates, why they sting upon application (they are very acidic), why they smell like vinegar (due to the acetic acid released from the hydrolysis of the Acetyl Salicylic Acid) and why they dry the skin so much. BUMP & BLEMISH® has a formulation that does not contain water, thereby insuring the stability of the Acetyl Salicylic Acid ingredient. In addition to its skin soothing action, Acetyl Salicylic Acid in the skin is slowly converted to Salicylic Acid providing a sustained exfoliating action without the irritation associated with high concentrations of Salicylic Acid. Commonly used skin brightening agents like Hydroquinone and Kojic Acid show numerous adverse effects. They tend to be highly irritant and capable of inducing allergic reactions. Hydroquinone, in particular, is known to be toxic to the melanin-producing cells in the skin (melanocytes) and may cause them to die and produce white patches. 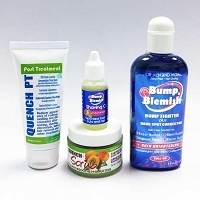 BUMP & BLEMISH® does NOT contain any Hydroquinone. The patented ingredient Chromabright® is a novel skin brightener that has been tested for efficacy and safety with satisfactory results. It presents no side effects, good efficacy in vitro and in vivo and, uniquely, a photoprotective effect. It acts by inhibiting tyrosinase, the main enzyme responsible for the generation of melanin in human skin melanocytes. The photoprotective effect on human epidermal keratinocytes helps prevent skin damage caused by UV radiation. The combination of Chromabright® with other skin brighteners leads to a product that acts faster and more efficiently than existing single components. Chromabright® is currently used in the most expensive skin creams all over the world. The patented ingredient OxyResvenox® is Hydroxy Resveratrol, a naturally occurring analog of Resveratrol, the well known anti-oxidant from red wine. Hydroxy Resveratrol is found in Morus Alba and other plants. It is a potent inhibitor of the tyrosinase enzyme- 32 times more potent than Kojic Acid, and without the irritation and sensitization problems frequent with Kojic. It helps reduce the appearance of dark spots and generally hyperpigmented skin. It has both skin brightening and soothing actions. The patented ingredient SabiWhite® is Tetrahydro Curcumin (THC), a natural derivative of Curcumin. Curcumin (also known as Turmeric) is a spice widely used in cuisines around the world. In addition to providing great flavor to dishes, it has health benefits that are now being well studied and documented. Sabiwhite is a strong anti-oxidant and skin brightening agent. It is a potent inhibitor of the tyrosinase enzyme (the enzyme responsible for the darkening of the skin); 7 times more active than Kojic Acid. Borage oil is the most concentrated natural source (20%) of Gamma-Linolenic Acid (GLA), an essential fatty acid (EFA). Linoleic Acid is an essential component of the membranes of every cell in our bodies, including the skin. Normally the tissues produce GLA from linoleic acid by the action of an enzyme named delta-6-desaturase. However, the skin lacks this enzyme, so it must get GLA it from the circulation. However, typical western diets are deficient in GLA, so the supply from the circulation is low, and is best to provide it by direct application to the skin. GLA helps restore the skin’s normal appearance after treatments.